What is a medical practice loan and what types are there? Any type of financing a medical practice obtains to either establish or grow the practice. Get practice practice financing based the sales of the practice or on equity in business assets such as accounts receivables or real estate. Find lenders online that specialize in medical practice loans. Evaluate the program features and benefits including how long the process takes and time to funding. Medical practices that have been operating for one year or longer will get higher approval amounts and better terms. Approvals are available with as little as 3 months time of operation. Match your practice to the loan programs available. Go with the one that best matches your medical practice characteristics. For larger practice loans over $100000 quick funding in 1 or 2 days is still available. Match your practice to the programs available. 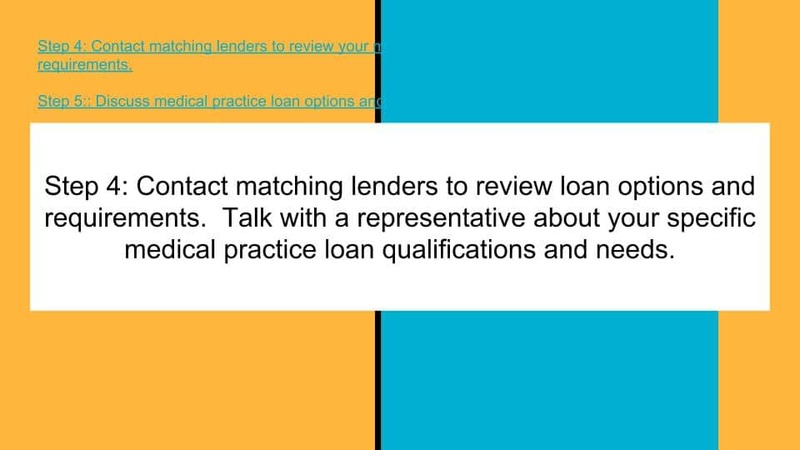 Contact matching lenders to review loan options and requirements. Talk with a representative about your specific medical practice loan qualifications and needs. 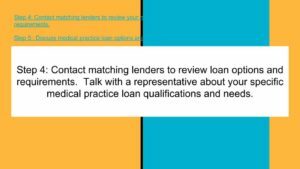 Call and talk with representatives of practice loan programs you feel are the best match. Discuss approval chances with the representatives. Submit an application. Try to provide any documents that show the strength of your medical practice. This can include the most recent bank statements as well as interim financial statements and tax returns. Other strengths include a profit and loss statement and personal financial statement. 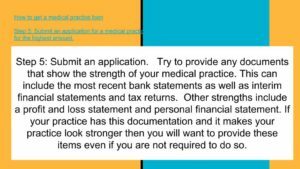 If your practice has this documentation and it makes your practice look stronger then you will want to provide these items even if you are not required to do so. Submit an application. Provide any documentation that makes your practice look stronger even if it is not required. Look over any approval offer including conditions and closing requirements. Provide items required for closing and funding. Complete the transaction and receive funding into your practice account. A significant tax savings will can be realized in this medical practice loan against equipment, by being arranged in part as a lease. This allows for a significant tax savings over a traditional loan. The borrower obtains working capital for their business via the equity in their equipment as opposed to having full ownership in their equipment. Same day and next day funding. Processing time is one to three days. After approval, time for funding is approximately one to three days. If more funding is needed, additional funding can be arranged with additional funding “parts” or “segments”. Total funding that can be obtained is typically in the $150,000 to $250,000 range. Due to constant advances in the medical field, medical equipment equipment depreciates quickly. Many types of medical equipment becomes totally obsolete in a short amount of time. However, Small Business Loans Depot can utilize medical equipment that has undergone full depreciation and is several years old. Gross sales cash flow loan – This financing product may be very desirable for medical practices as it is based on the gross sales and cash flow of the practice. Medical practices often have significant cash flow, so this product can provide significant working capital to the practice. This medical practice loan product is used, in effect as a line of credit. The practice provides the most recent 3 months business checking account statements and a one page application. The average daily collected balance, the amount and number of deposits per month, beginning balances, and ending balances are reviewed in order to determine the approved amount. The customer sends in the 3 months business checking account statements and one page application. Upon approval, the customer is e-mailed documents. The customer completes the documents and faxes them back in. A final landlord check and verbal verification is completed. Funds are wired into the customer’s account within 1-3 business days. Repayment terms on this medical practice loan range from 3 to 18 months. Once the customer satisfactorily repays the line, the line size is increased. The customer is not obligated to use the available line. They can reuse the line immediately or leave it idle for any amount of time. In most cases, financials and bank statements are not required. However, if the customer’s financials or bank Statements are strong, the customer can opt to provide to strengthen their application. If the customer has a strong credit bureau score of over 700 or over 725, financials may not be requested. Although there is a certain dollar amount above which financials are requested for this form of financing, there is often some discretion used by the lender. If the customer has a credit score of 750, then the lender may consider an extra $10K or $20K without requesting financials for a medical practice loan compared to a customer with a 675 credit score. The lender has guidelines that they follow but they do have the authority to stray from the guidelines to a degree if they can justify it. 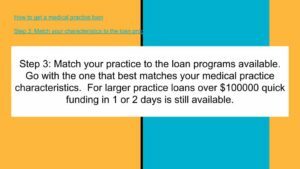 The following video provides an overview of the medical practice loan program as well, including features and benefits. We need a medical practice loan immediately. How fast can we get approved and close? Approvals can be obtained as fast as 2 or 3 hours. After approval if completed closing documents are returned immediately then funding can be as fast as the same day or next day. What is the maximum loan amount our practice can get? The maximum is determined by the cash flow and revenues of the practice and also the time in business and credit. Bank balances and the assets of the practice can also be important in approval and terms. 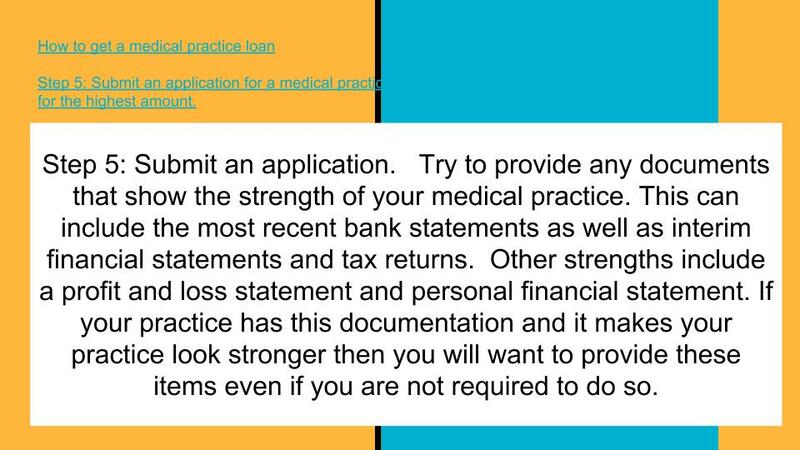 What are the requirements for a medical practice loan? The requirements for a medical practice loan are a minimum of three months time in business and revenues over $10000 per month. Other requirements include having enough cash flow to make the payment. The repayment may be monthly or weekly or daily. The revenues as well as expenses and net income may be looked at to make sure the practice can afford any payment required. After expenses the practice needs to have enough cash flow to show that the payment can be made. Can we get funding the same day or next day? Same day funding is possible if you apply early in the day and immediately provide any information required. Documents should be completed and returned immediately including any closing requirements. Our practice needs to constantly borrow and really needs a line of credit. Can we get a line of credit? If your medical practice needs to borrow a lot for different things then a line of credit or similar type of line will work best. Many of these borrowing products allow you to borrow then repay before you have repaid the full amount. Your medical practice can borrow again after repaying between 50% and 75% of the original balance. 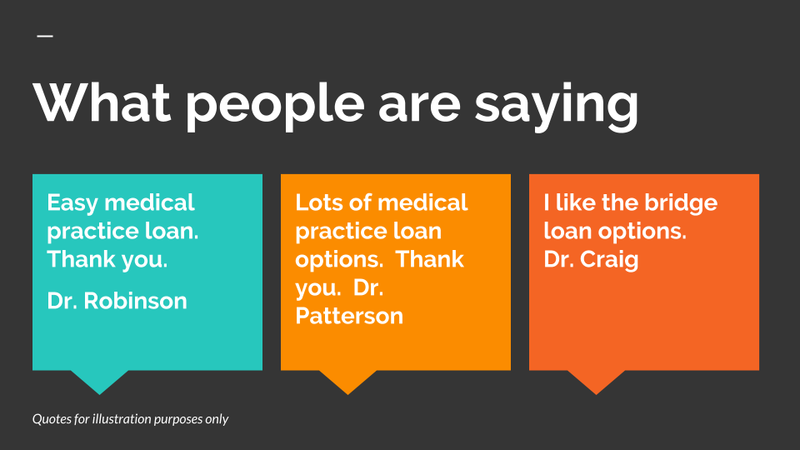 For some borrowing options your medical practice can borrow after every month of repayment. What do we need to provide to close the loan? Closing requirements are usually items such as proof of ownership of the practice or business. Proof of ownership is a copy of a business license or articles of incorporation. The Physicians license with the state the practice operates in may also be required. Other closing items may be landlord contact information and also a copy of a voided business check.